With the sorting and moving of parts comes another issue, proper parts storage. Here at CVF we manufacture and supply vibratory storage hoppers that hold a bulk amount of parts along with being used as capable storage bins. We offer a wide variety of vibratory storage hoppers with many sizes to choose from. Elevated prefeeders play a very important role in the parts business. Elevated prefeeders are used to supply parts at various heights. The cost saving benefits of using elevated prefeeders is invaluable. Not only will the use of elevated prefeeders save on operating labor cost, but elevated prefeeders provide the functionality of floor loading along with the capability of performing at various heights that are needed to satisfy certain requirements. CVF’s parts elevators include an adjustable angle discharge chute and a vibratory supply hopper with adjustable outlet gate. The belt elevator is available in standard heights with either a 6 inch-wide or 12 inch-wide cleated belt. The bulk storage hopper is offered in various sizes. Any elevator height may be combined with any capacity hopper to make up a complete system. The belt elevator unit includes motor and controller. 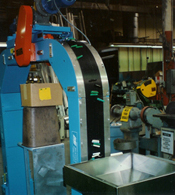 Operation of the system may be automatically controlled with an optional bowl level switch located at some strategic point in the processing flow. Here at CVF we strive to supply the parts industry with only the best products available. Our Conveyors are designed for efficient parts movement from one processing or manufacturing step to another. These versatile machines provide the vital interfaces that reduce labor requirements and operator fatigue while helping to maintain high production levels. Variable speed, adjustable height and portability allow the user to use the CVF parts conveyor in a wide range of parts movement applications. These units can be supplied in any lengths required by the user. CVF specializes in vibratory storage hoppers, elevated prefeeders and conveyors. We offer a wide variety of vibratory storage hoppers, elevated prefeeders and conveyors to suit all of your specific needs. Please contact a CVF sales representative for more details.